Allows cutting at 2x to 4x the normal speed! This unique tool holder is engineered with a high-tech precision ball bearing swivel unit. This unit, which holds a replaceable SC-1145 carbide plotter blade, permits cutting of materials in the "pen-plot" mode. Both inner ball bearing unit and outer housing are constructed from high impact anodized aluminum. Best results are achieved when cutting 1" letters and up. 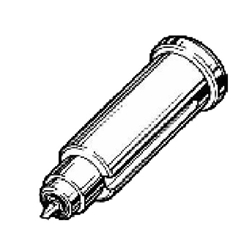 One SC-1145 blade is included with plotter tool adapter for use with 2-6 mil material.